Take JR Tokaido Line, get off the Tsujido Station. Turn left (towards North exit) after the central ticket gate. 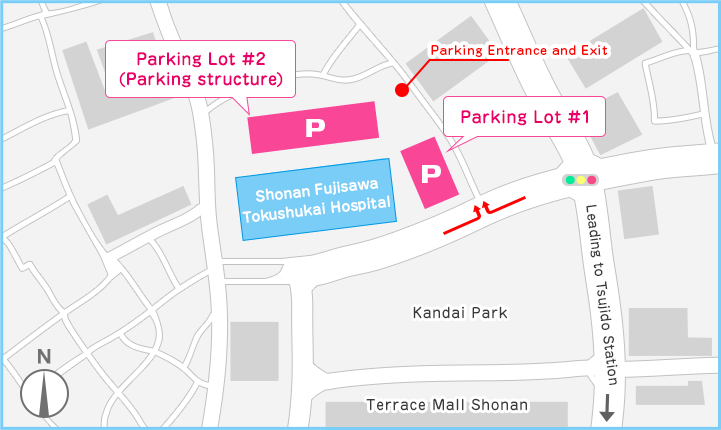 Take the elevator down, and stay straight for about 400m along the walkway at Terrace | Mall Shonan. Turn right to go through Kandai Park, and you will see the hospital ahead. Walking the hospital from Tsujido Station takes approximately 8 to 10 mins. Please refer the map below.